It Is What It Is: Let's Go to the Movies! In July of 2010, Cael saw his first movie. At that time, he was just starting to exhibit the patience necessary to watch an entire movie, so we decided to chance it and take him to Toy Story 3. He loved it-- sitting quietly and munching on his popcorn, he absorbed the movie and broke his focus only briefly to ask about the characters or attempt to pick a piece of popcorn off of the floor. Fast forward to July 8th, 2011. Cael is another year older, another year more mature. Yeah, right! 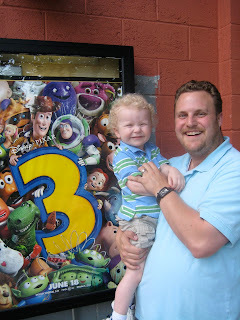 We had been anticipating the release of Cars 2, the sequel to another of his favorite movies, and the opportunity to take him to his second movie. He was excited and loves visiting the Bijou, a small theater in town that miraculously manages to show first-run movies and charges surprisingly little for concessions. My kind of place. After some debate, we decided to bring Graham along. Not only was his admission free due to his young age, but at home he is even more focused during "Mah Mow" (Mickey Mouse) than Cael on his best day. The odds are good that this will go well. And we all know that when I anticipate a great experience, it always works out. Right? We arrived at the theater and after purchasing our tickets, chose our snacks. We brought our refillable bucket for popcorn which cut our costs in half, so even though we were staring wide-eyed at a bathtub full of popcorn, we knew it was a good deal. A big diet Pepsi, a water for the boys and a battle over M&Ms later, we were ready to see the show. The popcorn was dripping with that clear, unidentifiable movie theater butter-- the kind that, in any other context would probably warrant a phone call to the Health Department, but on fluffy, popped popcorn is absolute perfection. We dug in and had half of it gone before the previews were even over. Relegated to the empty seat next to me, the popcorn would have to wait until the boys got restless. About three minutes into Cars 2, I knew we had a problem. Graham was watching intently on Daddy's lap, but Cael had not been hooked. Children need to be "hooked" into a movie just like an adult with a novel; if it fails to capture his interest within the first minute, he will NOT focus and follow the storyline. I didn't even blame him, to tell you the truth. The only recognizable connection to the original Cars was "Mater", the buck-toothed tow truck and a surprisingly small number of scenes with "Lightning McQueen", who was the main character. Other than their appearance on the screen, everything was different. The story was dark and much too heavy for young children to appreciate or even follow. There were spies, there were special agents, and there was a very wiggly 3 year-old in the 9th row struggling to make it through the first 10 minutes. So what do you do with a wiggly kid? Feed him. Not the choice I'd make at home or in any other situation, really, but in a dark room it was the only real option. Graham was getting squirmier, too, and was handed back and forth between Mommy and Daddy in an effort to keep him happy and quiet. Pass the popcorn bucket to Graham, please! It was no real surprise when, after less than an hour, the tub was empty and the boys were both talking, whining, wanting to play with my phone, taking off their shoes, and in general, doing everything one is NOT supposed to do during a night at the movies. When Joel chose that exact moment to walk out, I was plotting my next move. Do I put syrup in his hair while he's sleeping? Should I saran-wrap the toilet? If he had chosen to take a bathroom break, I secretly hoped there would be no toilet paper. What, exactly, is a sufficient punishment for leaving me with these boys when they are at the peak of restlessness? When he returned a few minutes later with the much-debated M&Ms, I was both relieved and concerned. 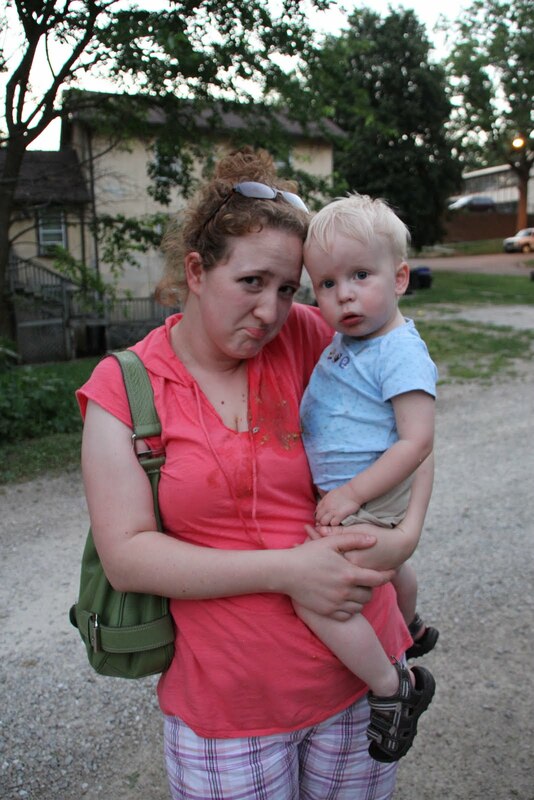 We had planned in advance that, if Graham was not able to make it through the movie, one of us would load him up in the stroller and walk home, leaving the other with the van to get home with Cael. I had reached that threshold and mentioned to Joel several times that I was about to take Graham out. A movie with an adult storyline acted out by computer animated characters does NOT a children's movie make. The M&Ms did buy us some time. Graham would moan for another as soon as one had left his mouth and while I tried my best to make him pace himself, we'd eaten through the pack in about 5 minutes. I tried to stifle his cries as he watched me fold up the empty brown paper bag that once contained his favorite treat, but he was still noisy enough to elicit looks from the people around us. This wasn't going well. Joel handed over the remainder of his M&M bag and we demolished those as well. I had a few. You know, just to make sure they were edible. What kind of mother would I be if I didn't check my son's food for health purposes? I quickly learned that I was the kind of mother that forgot to bring the diaper bag in the theater, and Graham was the kind of kid that needs to poop after eating a trough of popcorn and the better part of two bags of candy. I hope no one around us could hear the poop grunts my son was voicing. In fact, he seemed to be having some trouble with this one-- more than usual. I knew he was getting it out, because of the orangey-green cloud that was wafting away from my son and mixing with the other scents of popcorn and musty carpet in the theater. This wasn't good. I tried to give him a drink of water, perhaps to settle him down, but seconds later I could feel that he had spit the water out all over my shirt and chest. He does this from time to time; holding water in his mouth and spitting it out at some later occasion like a plaza fountain. But this felt different. Warm, chocolate covered bits of semi-digested popcorn and M&M candy shells were all over my shirt, down through my cleavage and were pooling in my bra. "Joel...psst... JOEL! Graham just threw up ALL OVER ME!" He stared, gaping, for a moment and then decided that laughing at me was the best course of action. I had to laugh too. Not at my sweet boy's misfortune, but at the utter disaster that had arisen from the ashes of what was to be Graham's "FIRST MOVIE EVER". I felt gross, sticky, smelly and completely disinterested in this animated spy movie that was playing before us. And I don't regret it one bit. That was the first movie I'd ever left without finishing, and I do think that vomit in one's undergarments is an acceptable reason for abandoning a film. Graham was fine, and as we both suspected wasn't really sick but had just consumed way too much grease and chocolate. After a thorough scrub-down and tooth brushing, he was out cold in bed and I was able to scrub off not only the throw-up, but the memory of yet another outing gone terribly wrong. "We watched a lousy movie and you wouldn't sit still. I fed you too much junk food and you puked all over me. What fun!" Oh well. Being the second kid, he's lucky he has a baby book at all. They WILL love the journals later on! I've actually done really well with Graham's baby book, but his is a different style and it literally doesn't have room for as much info. I'm doing my best with it! I totally wouldn't recommend Cars 2, but if you do go, I hope you have a better experience than we had!